We’ve known that GM was doing its best to convert Pontiac and Saturn owners to the remaining brands within the General Motors stable. In fact, we’ve received emails from readers who own Pontiacs and Saturns saying that they’ve received brochures and letters from GM to check out comparable Chevy vehicles. This time around, though, we have actual proof that you should be able to replicate yourself, behind the comfort of your computer, tablet, or smartphone. Looking For the Torrent? – Interested In a Pontiac Torrent? Why Not Consider a Chevy Equinox? Clicking on the ad takes the user to the Equinox landing page within Chevy’s website. We discovered this effort way back in 2010. But here’s something new: a Google search for Saturn Astra will return a sponsored ad from Chevy for the new Sonic. Looking At Saturn Astra? 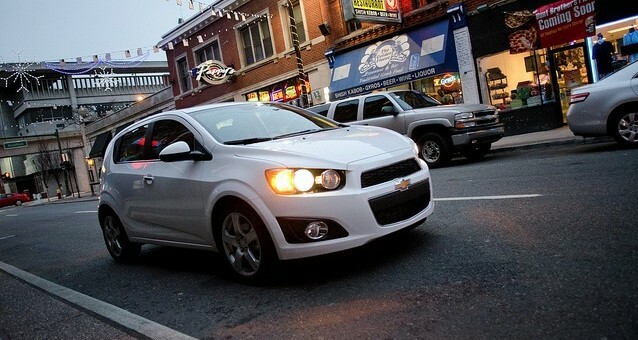 Introducing The All-New Chevrolet Sonic. Learn More on Official Site. We didn’t get any Chevy ads for Saturn Outlook, Vue, Aura, or Pontiac G6, G5, or G3. Feel free to do the above searches yourself and see if you get similar results. Note that the ad copy may not match up exactly with ours, since Google offers the ability to serve multiple ads for one campaign. If you’re an existing Pontiac or Saturn owner, have you received any communication from GM suggesting a Chevy? Talk to us in the comments. Next story Video: What Does Little Thomas Think Of The Chevy Silverado? Interesting I didn’t get that suggestion. In some respects, the LaCrosse would serve some G8 owners well. Both are mid-sized sedans, after all. And we all know there are G8 drivers out there who bought theirs for the family or because of a good offer — and didn’t have an ounce of performance on their mind. I typed in Pontiac G3 and I got a link to a suicide prevention group. I typed in Saturn Relay and got hits for end of life care. Sorry, I got that wrong. The end of life care was for the Buick Lucerne. For the Saturn Relay, I had low-cost canine de-worming treatments. Uh, I hate that armrest problem! A buddy has the same issue with his. I had a 96 olds delta 88 and they went out of business. Then I got a 06 Grand Prix GXP and they went of of business. Now I am afraid to buy a Camaro. Who knows what could happen! i typed Pontiac G6 and it says this: Interested in Pontiac G6? – Looking for a Pontiac G6? Then Check Out the Chevy Malibu. I’m not getting and Google suggestions for Solstice, Sky, or G8. I hope Chevy comes out with a G8 based performance sedan. SInce my work commute has changed alot since buying the GP in 2000, I’ll probably be looking for something 2 seater and sporty with a power to weight ratio close to 1HP/12lb (hopefully even better). Seems to me that the car for you is the Camaro (perhaps not in the power/weight ratio you’re looking for, though). Or one of the concepts debuted at the Detroit Auto Show like the 130R or 140S. Some of my comment was typing out loud. The more I think about what I want out my next car, the more I want to attack that ratio from both ends, and a smaller sport coupe is what I’m really leaning for. Either one of the 130 or 140 has potential if GM does it right. The Impala is around 3,700lbs — and the (much more modern) Taurus is even heavier. These are full-sized sedans, folks. Weight and enormous full-sized dimensions are a given here. It’s a given that the next-gen Impala will improve on all aspects — drastically. The current-generation model is a 13-year-old design, starting with the 1999 Impala based on W-Body gen. 2.